If life has gotten difficult with your pet, there may be help. Check out these resources to help with common pet problems. Our goal is to help you keep your pet in your home with you. Our favorite helpful tips are on the ASPCA website. Just about every dog behavior issues is addressed. Click here to find help for your dog. You may also want to take your pet to a positive reinforcement trainer. Click here for a list of those. Sometimes behavior problems are caused by health issues. Consult your veterinarian to be sure your dog is healthy. If you adopted your dog from the Brown County Humane Society and are having behavior issues, contact our Behavior Coordinator at 812-988-7362. Our favorite helpful tips are on the ASPCA website. Just about every cat behavior issues is addressed. Click here to find help for your cat. Sometimes behavior problems are caused by health issues. Consult your veterinarian to be sure your cat is healthy. If you adopted your cat from the Brown County Humane Society and are having behavior issues, contact our Behavior Coordinator at 812-988-7362. Feral Cat Issues – Feral cats do not belong in animal shelters and are best left in their own environment. However, they do need to be sterilized. Our SPOT program can provide all the resources you need to manage a feral cat situation. 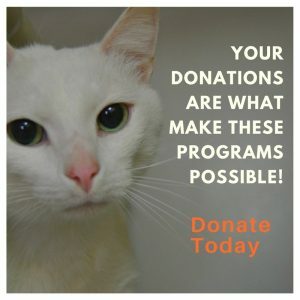 We can provide funding to help sterilize them, traps to catch them so they can be taken to a veterinarian to be fixed, assistance with transportation, and food to help you care for them. For more information, click here, or call SPOT at 812-703-0797. Spay/Neuter Assistance – If you need help to get your dog or cat fixed, call SPOT at 812-703-0797. Click here for more information. Allergies to Pets – If someone in your home has been diagnosed with allergies by a doctor, you may still be able to keep your pet. Children may outgrow pet allergies while others are able to manage their symptoms and keep their pet in their home. Click here to see what steps your family can take. Keeping your Cat During a Human Pregnancy – Many expectant mothers question if they should give up the family cat due to concerns about toxoplasmosis. Because it’s difficult tfor cats to transmit toxoplasmosis to humans, a pregnant woman is generally unlikely to contract the disease froom her pet cat. For more information, click here. Financial Problems – If you are temporarily having problems affording pet food or kitty litter for your pet, please contact our SPOT program at 812-703-0797. We often have donated food and supplies that we can give you until you get back on your feet.